The ultimate guide on how to make brownies! Step-by-step instructions and tips to make perfect homemade chewy, fudge brownies. Brownies generally fall into three categories – cakey, chewy, and fudgy. Cakey brownies are somewhere between chocolate cake and a fudge brownie. 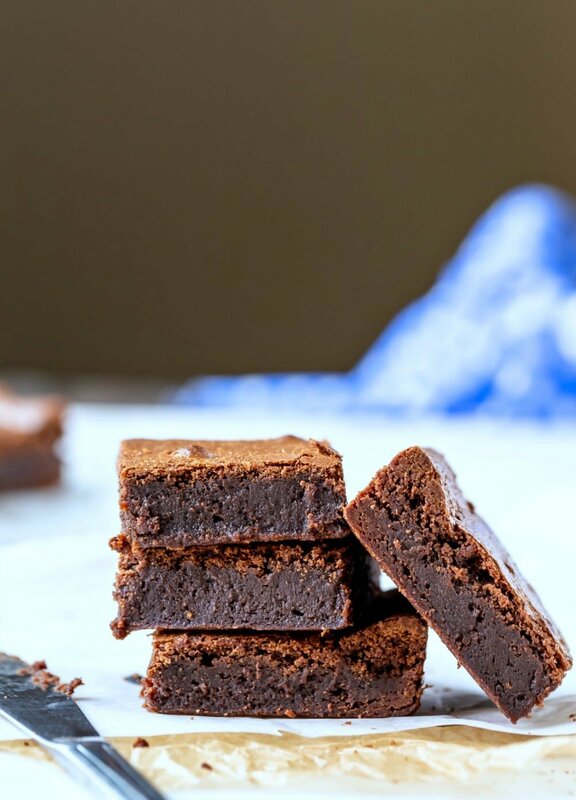 Chewy brownies have chewy edges and fudgy centers. Fudgy brownies are just what they sound like. They’re soft, fudge-like brownies. The brownie recipe below makes just this kind of brownie. 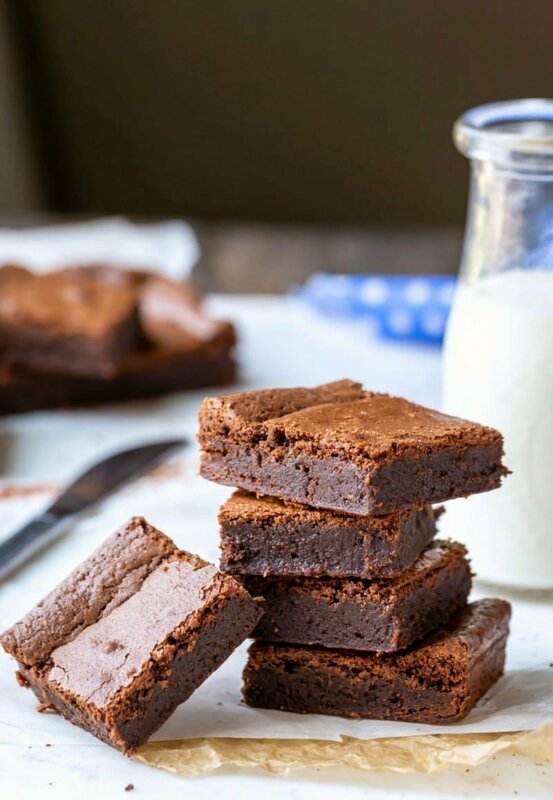 It makes brownies with a thin, shiny crust on top that are dense and fudgy in the middle and chewy at the edges. Why use vanilla in chocolate brownies? I love using vanilla in my chocolate baked goods. 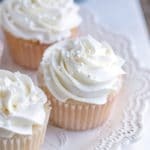 Vanilla is a fantastic flavor-enhancer, and it helps to bring out the chocolate flavor in brownies (or cake or cookies). 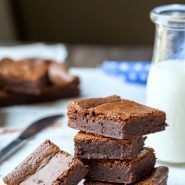 What makes brownies fudgy (vs cakey)? Cakey brownies have a greater ratio flour to fat and often using a leavening agent like baking powder in the recipe. 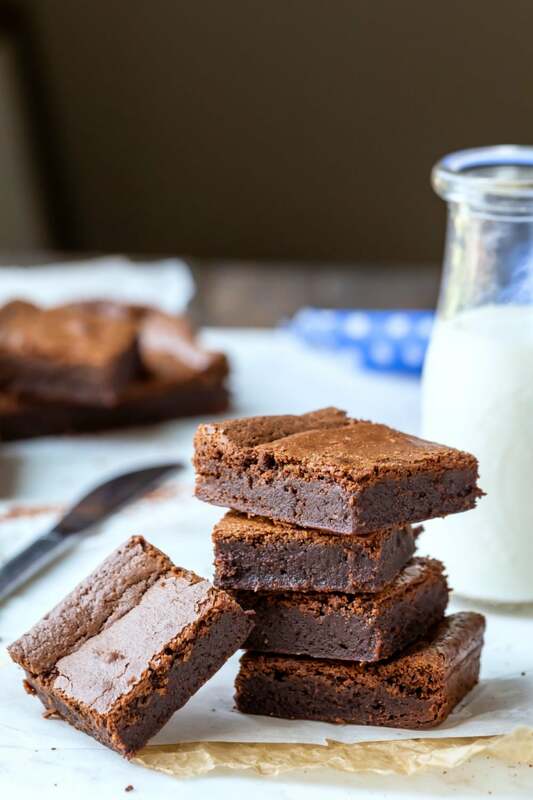 Fudgy brownies have a greater amount of fat to flour in the recipe. Here are step-by-step photos showing how to make the fudge brownie recipe below. The butter and chocolate should be just melted. You don’t want the mixture to be too hot. Once the sugars are mixed in, the batter will look grainy. That’s ok! 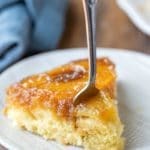 Once the eggs and vanilla are whisked in, the batter should look smooth and well-combined. 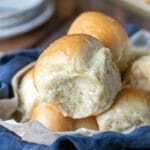 Whisking in the dry ingredients will give you a thick, smooth batter. The batter should be thick and smooth and glossy. 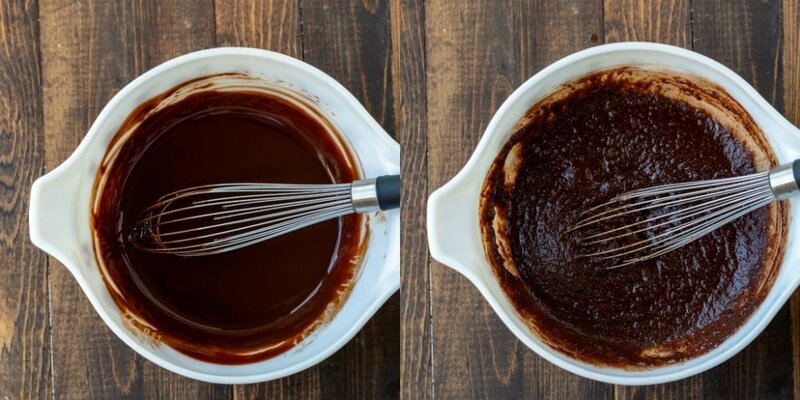 There are some keys techniques for perfect fudge brownies. First, mix the batter by hand. I like to mix the batter by hand because it’s easy and because it keeps it from getting over-worked. Overworking the batter means that you’ve developed gluten which is not what you want in a brownie. Second, don’t over-bake! More on this below. Third, don’t cut into hot brownies. This tip and the next tip are the hardest parts of making great brownies. Letting the brownies cool before cutting into them helps to improve the texture. Ok, stay with me on this one. I read this tip years and years ago, and I’ve never been sorry when I’ve let my brownies rest in the fridge. That time chilling really helps to transform the brownies into the perfect fudgy/chewy bars. 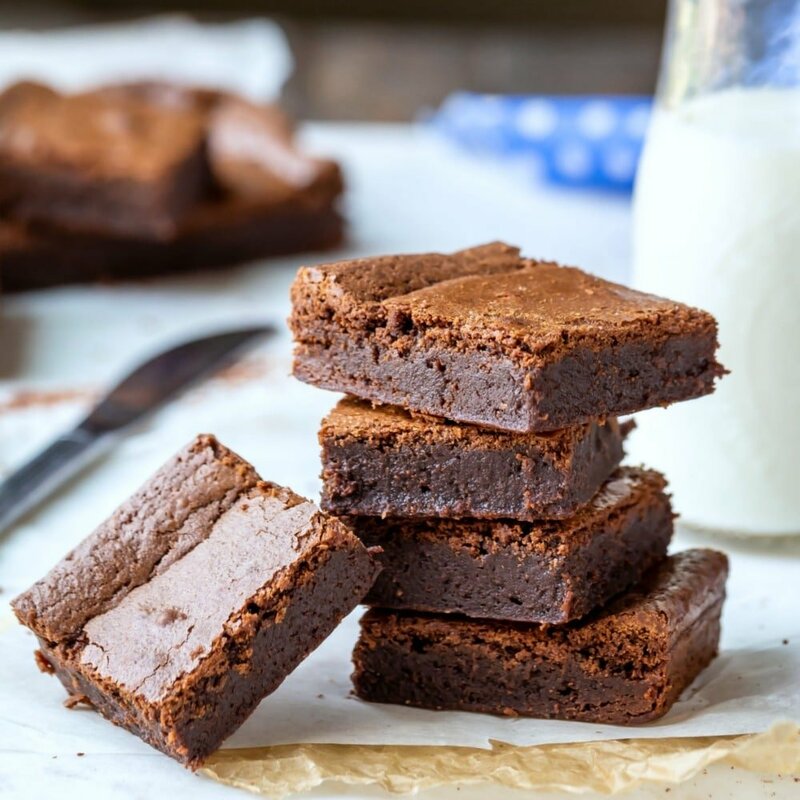 If you’re looking for brownies that are fudgy (without being chewy), check out this fudgy brownie recipe instead. Do I need baking powder to make brownies? Nope! Baking soda and baking powder are leavening agents. The brownies aren’t rising or expanding the way that cakes, muffins, and cookies will. Some recipes will call for baking powder, and that’s ok. It just isn’t necessary in every recipe. One of the keys to making great brownies is to avoid over-baking. They are finished baking when a toothpick inserted in the center comes out with a few fudgy crumbs. If the toothpick comes out clean, they will end up being dry or even crumbly once cool. I like to use a bench scraper to cut my brownies. It has the perfect sharp edge that gives me clean cuts. I cover them with plastic wrap and put them right back into the fridge. I think it helps to keep them fresh, too. My brownies keep for 3 days (they never last longer than that in our house) and still taste fresh when they’re stored in the fridge. Absolutely! Unfrosted brownies freeze well for later. You can freeze them as a whole pan or in individual pieces. To freeze an entire pan, let the brownies cool to room temperature, wrap well in plastic wrap, and then freeze. If freezing an entire pan, you can either bake the brownies in a disposable pan or line the baking pan with parchment paper. The parchment paper will allow you to easily lift the entire pan of brownies out. To freeze in pieces, wrap cut brownies well in plastic wrap and then place in a freezer bag. 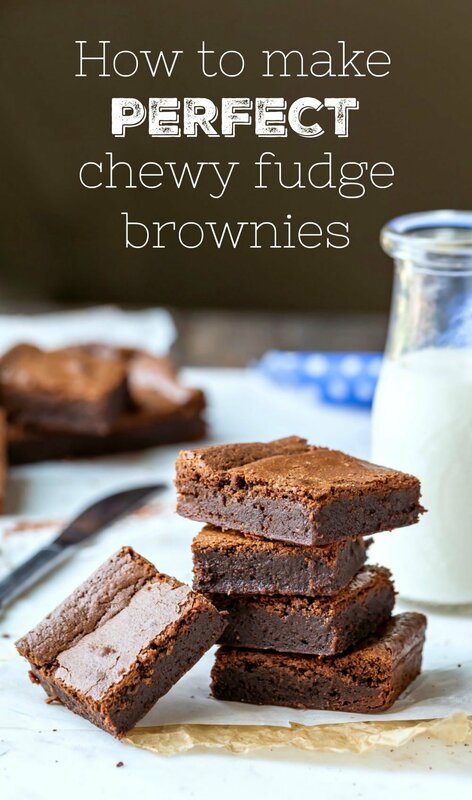 If you’ve tried this chewy fudge brownie recipe, don’t forget to rate the recipe and leave me a comment below. I love to hear from people who’ve made my recipes! Preheat oven to 350 F. Line an 8-inch square baking pan with parchment, leaving a slight overhang on all sides. 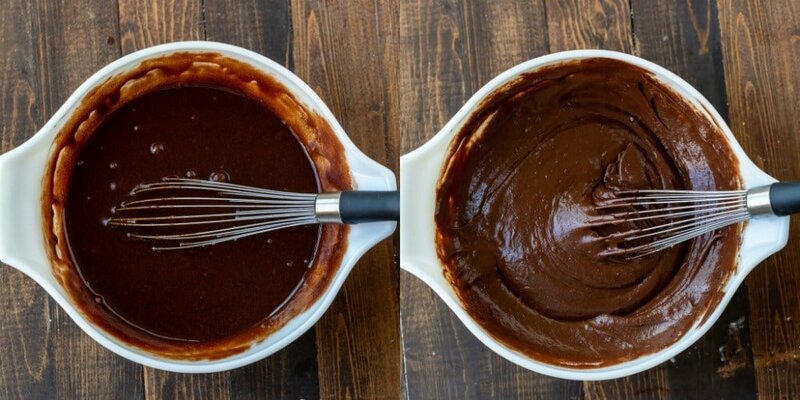 Add butter and chocolate to a microwave-safe bowl, and microwave for 30 seconds. Stir, and continue microwaving and stirring in 15 second intervals until butter and chocolate are melted and smooth. It usually takes me 1 minute total. Whisk in sugars until well-combined. Batter will look grainy. Whisk in vanilla and eggs, 1 at a time, until combined. Batter should look smooth and be well-combined. Fold in flour until combined. Batter should be thick. Bake for 30-40 minutes, or until toothpick inserted in the center comes out with fudgy crumbs. Let cool to room temperature in pan. 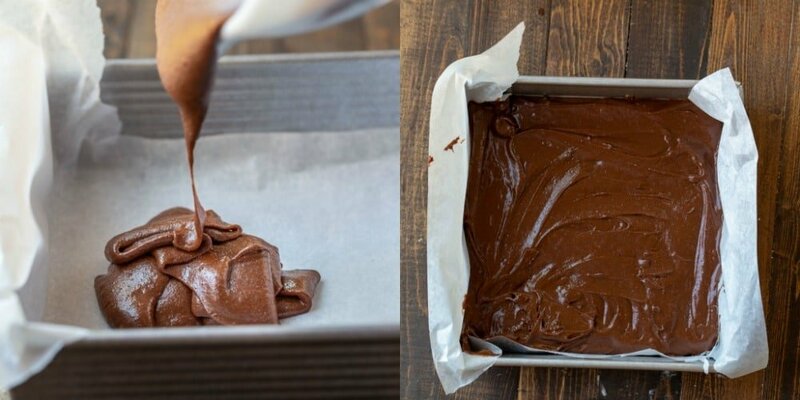 Cover brownies, and chill for at least 3 hours. *Good-quality bittersweet chocolate chips will work in place of chopped chocolate. **Be sure to avoid packing the flour. I fluff the flour, scoop, and level. Hi Kate, I was looking for your fudgey brownies recipe and I could only find this one. Would you be able to send me the original recipe as this one is different and the old one was foolproof! Absolutely! I’ll email it to you. Hello! I used to use your other fudgey brownie recipe too. Could you email it to me? Hi! Yes, I’ll send it to you. These are the BEST brownies!!! They’re better than my favorite mix and it was my secret for great brownies. Thank you! BEST brownies ever!! The tips help. Thanks for the great recipe! I’m glad they were helpful! Thank you!